Maze Rattan Tuscany 6pc 2 Seat Sofa Set: This sofa set consists of a 2 seater sofa, 2 armchairs, 2 footstools and a glass top coffee table, the set is supplied in a beautiful natural colour with cream cushions and is designed to be left outside all year round so that you do not need to worry about clearing storage space for it over the winter months. 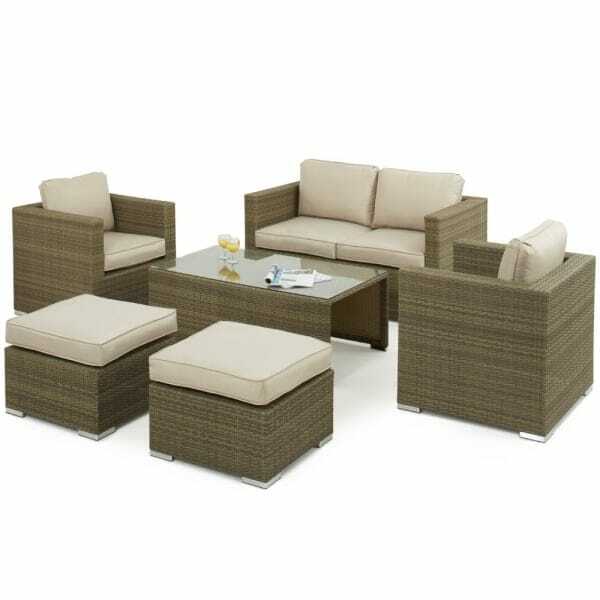 This set features a flat rattan weave which is extremely low maintenance and is 100% weatherproof. This set will look stunning no matter what the environment and would serve as conservatory furniture. This sofa set is suitable for up to 6 people when using the footstools as additional seating and when not in use the footstools store neatly away under the coffee table. The table glass is tempered for additional safety when in use and will provide you with plenty of room for drinks and other refreshments. This set is delivered fully assembled for convenience and includes a 5 year manufacturer’s warranty for absolute peace of mind.